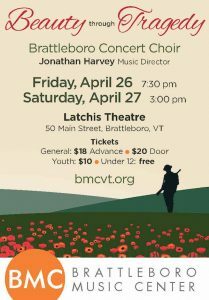 The Brattleboro Concert Choir presents “Beauty Through Tragedy: The Music of Ralph Vaughan Williams & Amy Beach” in two concerts, April 26 and 27. 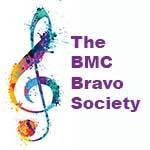 The concert Friday, April 26, is set for 7:30 p.m. at the Latchis Theatre, Main Street, Brattleboro. The Saturday, April 27, performance, also at the Latchis, will begin at 3 p.m.
Amy Beach was the first American woman to publish a symphony, and the first major American composer of any gender not to receive early training in Europe. She was seen in her time as a distinctly American voice. She is often compared to Brahms, especially for her rich harmonic language. Her Four Canticles op. 78 is a sumptuous setting of four psalms in English, leaning into evocative descriptions of nature and music. The Canticles were published in 1916, at the height of the First World War. Beach had been living in Germany since her husband died in 1910, and returned to the United States when the war broke out in 1914. As Beach was composing the Canticles, Ralph Vaughan Williams was serving as a member of the Royal Army Medical Corps, driving an ambulance in France and Greece. He wrote Dona nobis pacem two decades later, in the years leading up to World War II, having witnessed firsthand the horror of “the war to end all wars.” When he was commissioned in 1936 by the Huddersfield Choral Society to commemorate its 100th anniversary, he addressed the rising political tensions in Europe with a deeply-felt warning about the realities of war, and an appeal to reconciliation and communal action for peace. Dona nobis pacem sets texts drawn from the Roman Catholic Mass, Biblical passages, an anti-war speech by 19th century British politician John Bright, and the Civil War poetry of Walt Whitman, combining them into a prophetic plea for peace.